Villa Hoogvliet, Heerlijkheid Park, the Netherlands, FAT, 2009, © FAT. 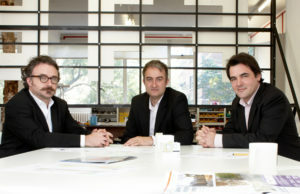 FAT: Sean Griffiths, Charles Holland and Sam Jacob. Featured in both the book Anglo Files: rising UK architecture (Thames & Hudson, 2005), one of my publications, and Space Invaders, the British Council international touring exhibition, 2001-3, I curated with Pedro Gadanho (a catalogue is still available, and a series of video interviews filmed by Elliott Chaffer is now a collectors’ item), the irrepressible FAT – aka Fashion Architecture Taste – has ‘decided to break up the band’, but go out on a high. As some of you may have heard, we at FAT have decided, in the words of Ziggy Stardust, to ‘break up the band’. He continues: ‘FAT was always more of a project than an office, and we all feel that we’ve really completed that mission. We evolved from our early days as a ‘loose collective’ into an influential international practice which we hope leaves a useful legacy. We feel proud that we took a conceptual architectural position out into the world in the form of many built projects both in the UK and abroad. In the manner of a band, though we’re going out on a high: Our last two projects will be completed next summer: A House For Essex designed in collaboration with the artist Grayson Perry for Living Architecture, and curating the British Pavilion at the Venice Biennale with a show titled A Clockwork Jerusalem. I’d like to thank everyone who has been so supportive of us over the years, giving us so many fantastic opportunities and experiences. Of course, I’m still around. I’ll continue as Professor of Architecture at UIC in Chicago, as Director of Night School at the AA, writing for Art Review and Dezeen amongst many others. And there are range of exciting design projects coming up in the new year too which I hope to be able to share with you soon. Anyway, so long for now, happy holidays and here’s to an exciting 2014!